Maruska is a trailer sailor! It has been awhile since I have even posted. I took a new job mid October and it has been a nonstop get up to speed marathon ever since. I commute 122 miles a day but not to worry, in Buffalo it only takes a casual hour and 10 minutes each way. The rest of the story is that I was able to fit the trailer to Maruska that I picked up last winter. The project was not without calculated risk and my typical level of trial and error and one big oops! The boat was pulled just before our October 15th out of the water deadline. We lowered the boat on to the trailer with the travel lift and the front pads were too high. The measurements that I used were OK but I switched the location of the posts at the last minute and did not use the second set of measurements I took for the new location. A few hours latter, some cutting and welding and she sat as if the trailer was made for her. We rolled her through the boat yard to her temporary resting place on three of her four axles. The fourth axle I added to meet the package total road weight and it took an additional three weeks for that little item to arrive. Once mounted all four axles were ready to roll by mid November. I met my hauler late on a Saturday, hooked her up, checked the lights and proceeded to make a rather tight "S" turn to negotiate the exit gate. All eight wheels complained strongly across the lightly graveled pavement during this first 100 feet of "S" turn and all appeared to be just fine until a slight knoll heavily loaded the front most axle. The knoll and abrupt lack of lubricating gravel twisted the front inside tires awkwardly. The combination of the tight "S" turn, knoll and a razor sharp front spring mount bolt tore the side wall out of the starboard front tire. The return trip back to her parking spot on seven remaining tires went without further expenditure, and the post haul autopsy revealed the issue with the sharp bolt head. Two weeks passed before my hauler had another opening and I spent the time fully seating the spring bolt , removing the sharp edges on the suspension hanger and rounding and smoothing the razor sharp edges of the offending bolts. With another new tire mounted, we decided that this trailer had to roll rather than pivot. It was sort of like lifting your feet instead of just twisting your ankle. We also mounted a higher rise receiver into his hitch as our post evaluation also suspected that the trailer rode a bit tongue down during our first attempt. Once out on the flat parking lot, all four tires now appeared to be loaded all about the same and during the turn the tires seemed to scrub much better than the first attempt. Now that the boat was away from the others the whole package looked like it belonged together. Everything looked in proportion, the boat was balanced and we were on our way. Although he only topped out at 50 mph, the boat trailered I felt, better on this trailer than on his hydraulic trailer. He said that he would have gone faster but the tire noise seemed excessive and reminded him of a loaded dump truck. I suspect that because the trailer still had no fenders, there was nothing to muffle or deflect the road noise. The tires also are much more aggressive than his smooth ribbed tires. As usual, success was a meer fleating moment and the farther were got out in gods country the more wintry it became. There were several sections of snow covered blown over road but it was the driveway that did us in. The truck and trailer slid to an awkward stop on our little dip in the driveway and 25,000 pounds of boat and trailer overwhelmed the trucks ability to make any progress in the reverse direction. This of course was after we determined an ice covered driveway, a nasty little dip and a maiden voyage was not the best of combinations. Several scoops of coal ashes, an undersized tractor and a log chain and the boat spent the night across the road in my neighbors lower driveway. The following day brought warmer temperatures and the boat rolled into the barn the following night. I love when a plan comes together and this one still has a few loose ends such as sandblasting and paint. There still is the issue of fabricating custom four axle fenders, installing new lights and I am so much in love, I am thinking pin striping. 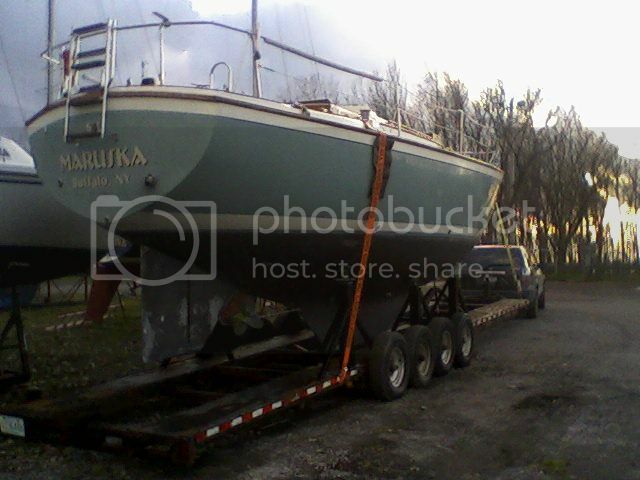 Re: Maruska is a trailer sailor! Allen & Michelle Willis Owners of S/V Incommunicado. Hull # 18. Have owned her for 20+ years. For those of you that don't know, Allen is also a P365 trailer sailor. He built his trailer a year or so ago and his boat goes home as well. Good to hear from you Allen. I was thinking varnished teak fenders with polished aluminum diamond plate top inserts. I have been hunting for nice rims for this trailer. The ones it came with are as plane jane as you can get and the additional ones I picked up for the 4th axle are ratty old ford rims that don't match and are even more ugly. With a slight modification I could use 16" GM 8 bolt truck wheels from around 2000 on up to 2010. They of course were available in chrome. Unfortunately finding eight in nice condition for a reasonable dollar is the trick. This trailer is rusty. It appears that the builder never prepped the surface and water got under the paint and it is one huge blister. For being a 2005 everything is rusty. Hey, for $1500 you can't expect too much. Once the boat is off in the spring, it will be sandblasted end to end, top to bottom and primed in a high build epoxy. It would be cool to match the boat color wouldn't it. I really like that idea. Maruska birds egg green/blue with white pinstripes to match her boot stripe, semi gloss black undercarriage, sitting on chrome wheels! Now that will be a ROAD TRIP in need of some Photos! Yep...I still visit the site and still wish we had our P365! 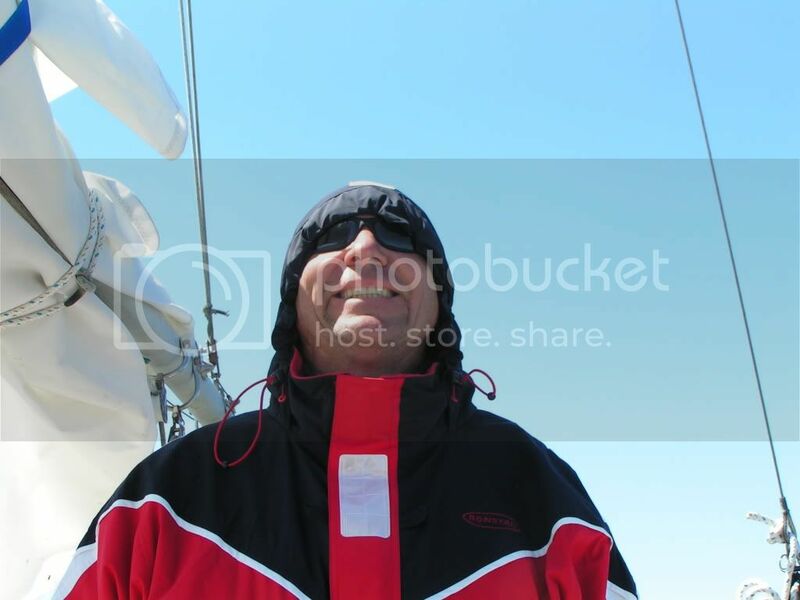 Hudson Force 50 Ketch...but we MISS our Pearson 365!!!! Not mine but my cradle was copied on a low boy 5th wheel farm trailer. The 1 ton truck towed it from Duluth to Fargo (about 240 miles) at 50+ mph. If you have a truck scale handy you can weigh your boat! So glad you posted that picture. Looks good up there by the way. Those front pads are where I believe mine would have ended up had I not moved them in 6" at the last minute during the trailer build. This was the cause of the "little" issue and the required modification down at the boat yard. I can also see why my heights were off a bit as every inch the pads move toward the centerline of the boat several inches must be removed from the overall height. I added one extra "V" pad under the bow to keep her from dipping in the event of an emergency stop. Good to see you are still alive and kicking Rich. By the way... where in the world are you currently? Now that you mention it, they did much the same thing. Gotta love farmers, they borrowed the marina's torch and modified the front pads before hitting the highway. They did tell me that the 800ft climb from the Lake level to the "top of the hill" leaving Duluth was a little slow but after that it was 50-60 mph for the rest of the trip. 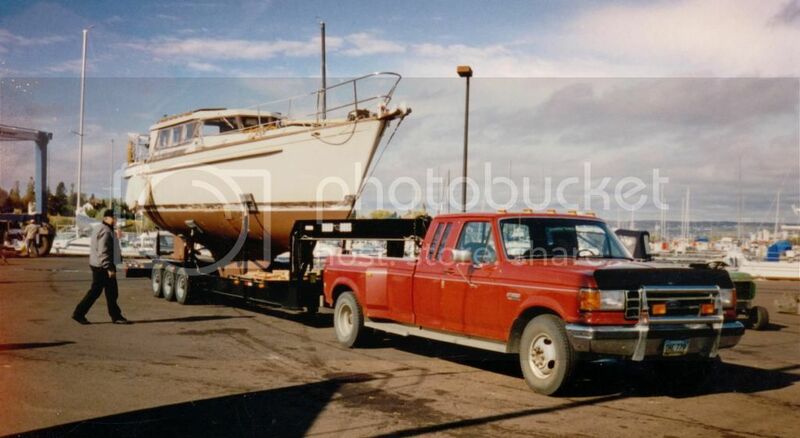 This boat was sold and traveled to the East Coast, and a couple years later was sold again and brought back here. I don't know what happened to the trailer, but I'll guess it's hauling farm equipment. I believe the boat weighed 18,000 lbs. Found this in my phone.